I am going to guess that you’ve never eaten kelp pasta before. 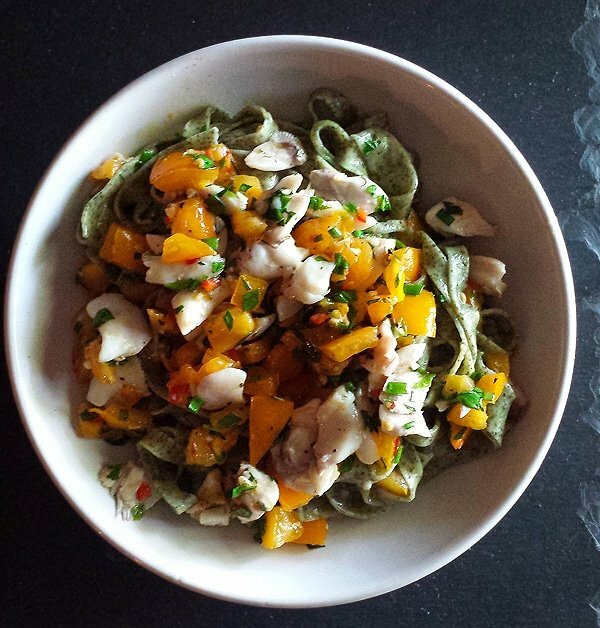 I am sure someone makes it somewhere, but I’ve never seen it on any menu — although I do see people making “kelp pasta” from thin ribbons of the fresh seaweed, which I find, well, a whole lot weirder than this lovely green tagliatelle. The idea came to me while fishing with my friend Matt Kimura earlier this summer. We were fishing for Pacific rockfish among the kelp beds off the Sonoma coast. I’ve collected kelp when it washes up on shore for a few years, mostly for pickles. But I also know you can dry the fronds and grind them into a powder, which some people use as a sort of health supplement. So I made myself some kelp powder. It’s pretty easy: You dehydrate the fronds of really any seaweed, but kelp is the best. (drying them in the sun works, too.) The break up the dried seaweed into bits and then put it in a spice mill and grind the hell out of it. One thing I noticed is that it won’t all grind fine, though. A portion won’t grind finer than flakes, which I sieved out and used to fertilize my plants. You can’t use these flakes to make pasta because they’re too large and will disrupt the formation of gluten in the noodle, causing it to break apart. Armed with the powder, the rest was easy. You can add a little of pretty much any powder into a pasta dough, and it will mostly affect just the color. You need to add a lot to get much flavor. The kelp powder adds a saline, slightly iodine-y flavor that reminds of of being on the ocean — that said, you wouldn’t want to eat it unless there were some other aquatic thing going on in the dish. Like rockfish. I was taken by the idea of a dish where the fish are swimming among the kelp, as they do in life, only the “fronds” would be pasta. I filleted the fish as normal, then poached the carcasses and flaked off all the extra meat; the cheeks and the meat around the pectoral fins are the best. Waste not want not. Tossed with the best of NorCal’s summer vegetables, mostly from my garden, and you have what’s really a very simple dish that is as NorCal, “Cal-Ital” cuisine as you can get. What if you don’t live in California? Well, kelp lives on all seacoasts, or you can buy kelp powder online. And rockfish is just what I have here. Any white meat fish would work, as would any sort of seafood. Shrimp or crabmeat spring to mind. What if you are inland? A freshwater version would be easy to do, too. 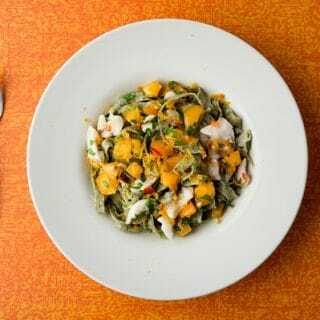 Use pureed watercress — another excellent aquatic vegetable — instead of seaweed (follow my ramp pasta recipe as a model) and then use perch or walleye or crappie. Same idea, different region. 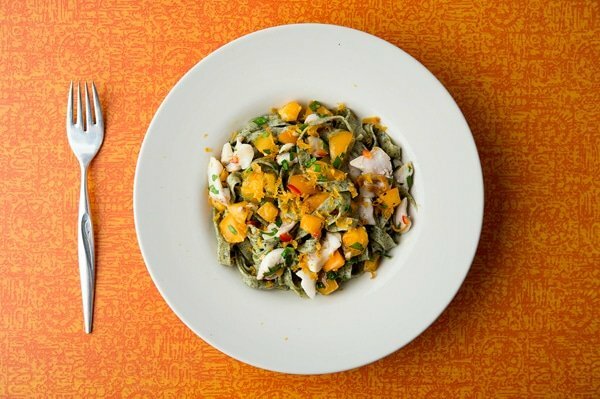 The kelp pasta is the key to this dish; yes, you can of course make it with regular pasta, but then it's not so special, is it? But believe it or not, you can buy kelp powder online or in health food stores. I made my own, but I guess I didn't need to. Everything else in this recipe is up to you. You can use any sort of fish or other seafood, and any combination of vegetables. You could even go with dark, leafy greens and root vegetables to make this a winter dish. I also use bottarga di muggine from Sardinia, which is dry cured mullet roe you grate over the top of the pasta. Admittedly it's esoteric, so skip it if you want to. Start by making the pasta. Mix all the ingredients well in a large bowl and form into a dough. Knead it for 4 to 8 minutes, until the dough becomes elastic and pliable. Cover the dough with plastic wrap and let it rest for 1 hour. Or, if you have a vacuum sealer, you can vacuum seal the dough and it will hydrate instantly. Chef's trick. Either way, you'll need to let the "sauce" marinate. Mix all the ingredients for the fish except for the lemon juice and bottarga together in a bowl. Cover and let this marinate at room temperature for at least 30 minutes, but I normally let it marinate all during the time it takes me to roll out my pasta. Roll the pasta out on an Atlas pasta maker, or whichever pasta roller you have (or roll by hand) until the dough is thin but not too thin. I go to No. 7 on my Atlas, which is two stops before the thinnest setting. Either cut your tagliatelle by hand or use the Atlas linguini attachment to cut your noodles. Dust the freshly cut pasta with some flour and set it on a baking sheet that is either lined with parchment paper or that has been sprinkled with semolina flour or cornmeal. To finish the dish, boil the pasta until it floats, and then for 1 more minute. Drain and toss with the sauce. Add the chopped herbs, lemon juice to taste and then grate the bottarga over it if you are using it. Serve with a crisp white wine; I'd suggest a Sancerre or a really good Pinot Grigio. Once you make the pasta, it will dry reasonably well (it gets brittle, though) so if you wanted to dry it fully you can. Looks awesome Hank! Why no egg in the pasta dough? Because a) pasta doesn’t need eggs, and b) egg yolks alter the color, which I did not want. If you absolutely must have eggs in your dough, use whites only.